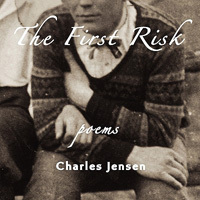 Charles Jensen, winner of the 2006 Frank O’Hara Chapbook Award, has delivered an admirable full-length collection with The First Risk, a recent Lammy finalist for best gay poetry. Above all, The First Risk is a study in contrasts, dualities, and fractured relationships. 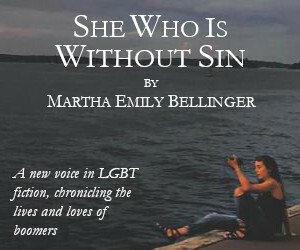 Divided into four sections, the first—and perhaps, inevitably, the most powerful—shuffles together a series of poems about Matthew Shepard with a series about the death of Adonis. Eulogies and artistic statements about Matthew Shepard have been fairly common in the twelve years since his brutal murder, but many have failed. Loaded topics can misfire—poets still struggle to find the right note regarding 9/11—and, especially for gay artists, Matthew Shepard is a powerful symbol, on the order of St. Sebastian, but also a potential liability. 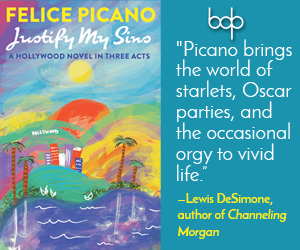 The poem’s slightly formal tone and measured confessionalism help coax the reader into the treacherous waters of this topic. his body sputters, skin goes numb. Jensen’s most explicit handling of Shepard comes in “I Am the Boy Who Is Tied Down.” Written in long lines (Lethe has accommodated these lines by publishing the book in an extra-wide 8.5” by 8.5” format), the poem calls Walt Whitman to mind, particularly in its “Song of Myself”-style anaphoric use of “I.” It’s a style most common these days in rant or brag poems, and given the delicate subject matter, it’s a big risk, but overall, it pays off. pushed down, picked up, pushed down. the half of that, the half of that. I refuse to let the boy reach the fence. do it with a knife. Staying with the cinematic theme, the third section, “The Double Bind: A Critical Text,” provocatively pairs somewhat dry film criticism-style prose poems about Hitchcock’s Vertigo with short lyric poems. The prose poems (which read as mini essays, and really only emerge as poems in relationship with the poems they face), are insightful—one in particular interests with implications about latent homosexual and transgender identity in the Jimmy Stewart character—but they rarely lift off the page. Despite the thread of visual art and cinema that helps to stitch the ambitious themes of The First Risk into a cohesive whole, the collection is ultimately more reminiscent of music than film. Jensen’s poems, with their strong narrative voices and endings like soft crescendos, demand to be heard.